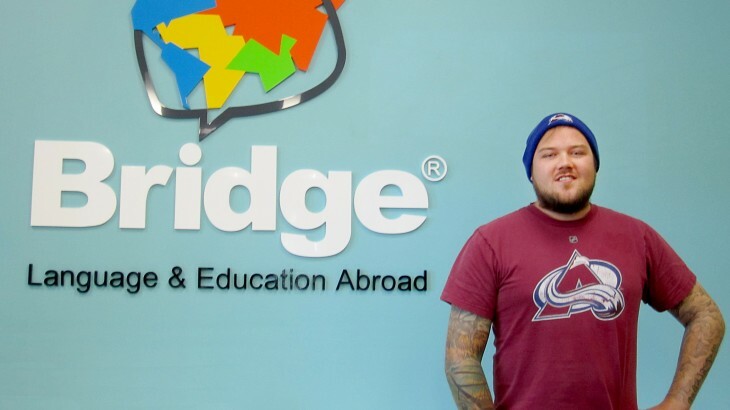 Marc is a student that is studying at BridgeEnglish Denver. He chose to study English because it is one of the well known languages in the world. Once he graduates from the program, he will return to Switzerland as a chef and continue to practice his English as a hobby. Someday, he’d like to fulfill his dream of opening a restaurant or sports pub in the United States. We asked Marc some questions about his time in Denver -read what he has to say! I am a chef in my home country [of Switzerland] and it is a beautiful place. I like Denver and hockey! I also have some relatives in Colorado Springs. I love it here! Why did you choose to come to Bridge English Denver? My agency told me that Bridge is the best English School in Denver! What do you like the most about the U.S.? I like the weather in Denver, and the Colorado Avalanche hockey team. Also, the people here are very friendly here. I think that it’s more laid back and not stressful here. I miss the Swiss cheese! What has been the most academically challenging portion of your immersion experience in the U.S.? Nothing has been difficult, I’ve made a lot of friends and have had a lot of help from teachers here at Bridge. What are the biggest academic differences you see between here and in your home country? At bridge the teacher’s are more laid back and have interesting lessons. Great teaching styles! I like the themes (topics) in my classes. Hockey, I love the nature and exploring the outdoors in Denver. I enjoy the night life in Denver. What was your perception of the U.S. before you visited? Has it changed? Before coming to the US, I heard a lot of stereotypical things about the U.S. and about Americans. Yes! My perception has changed and I believe that Americans are helpful and friendly. Do you have any plans for after graduating from Bridge? Yeah, I must go to the Swiss Army. (He has 6 more weeks left in the Swiss Army.) I may continue with the Chef position after my Army duty. Any advice for someone who is thinking about learning English or interested in studying abroad? You must plan your trip and be organized! It is important to get to know the culture by going to activities. Go visit the outdoors and big cities. Enjoy the nature. Do you want to study general English in the U.S.? Learn more about our General English Program here. esl-blog, Meet our students! English student, learn English in the US, study English in Denver. permalink.